We share heaps of healthy information on Nutritious Life’s blog every day, but “In the Kitchen with Keri” is your chance to spend some quality time with the wonder woman behind it all, Keri Glassman, MS, RD, CDN. It’s where she invites you into her space to share the ingredients she’s currently obsessed with, recipes she can’t get enough of, and other tips and tricks learned over many years of life as an always-ahead-of-the-curve nutritionist and wellness expert. Years ago, I used to take more time to cook with interesting, unique ingredients regularly. (You know, in the B.C.—before children—era.) Now, I’ve definitely become more of a creature of habit. That means having go-to ingredients I can depend on is key. Don’t get me wrong, I always love when a recipe calls for something new. Keeping an open mind in the kitchen is important, because you don’t want to get so bored that you end up making the same things over and over. (Remember, variety is key to getting all of your nutrients and not downing a dozen chocolate chip cookies after dinner!). You have to push yourself to go and look at new things at the grocery store, or when you try a new recipe, don’t feel like it’s a bad thing to have leftovers of a new ingredient. Look at it as a way to expand your kitchen repertoire. When I have to buy a new ingredient for a recipe, it undoubtedly will be used again and again. I was making a new dish recently that called for pepperoncinis. I fell hard for the flavorful, nutrient-dense veggies as soon as I tried them. Now, I always have them around and I chop them up to add to all kinds of things. Pepperoncinis and eggs? You bet. 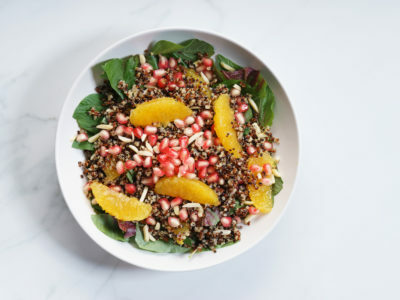 The key is having a few staple, go-to ingredients always on hand so that you then have the freedom to get creative with things like toppings, dressings, and new combos. These are the five staple ingredients I’m currently never without. Oatmeal is such a go-to breakfast for me and my kids, especially since you can make it in so many ways by just adding different things to it, like nuts, nut butters, seeds, fruit, and spices. It’s filled with fiber and protein and is super satiating. For the busiest mornings I make overnight oats. And, I will use oats when I want to bulk up a smoothie. Plus, you can bake with them whole, grind them and make oat flour, or make a healthy homemade granola. RELATED: Are Steel Cut Oats Healthier Than Rolled Oats? I literally add it to so many things, sprinkling its many health benefits all over the place. That includes my coffee, smoothies, oatmeal, and baked goods. I’ll put it on a slice of Ezekiel Raisin Bread toast with coconut oil for breakfast. I sprinkle it on apples and pears for my kids for a snack. I’ll put it on sweet potatoes with coconut oil at night. I even have a chili recipe that calls for cinnamon. Predictable, I know, but you may already know I’m totally obsessed with healthy fats. Avocado is so satisfying because of the fat and fiber, and it’s loaded with antioxidants. You can put it on toast, of course (do it for the Insta! ), or in a smoothie, salad, grain bowl, or creamy salad dressing. Pro tip: Cut it in half, toss the pit, add a little lemon juice and sea salt, and eat it with a spoon directly out of the skin as a snack. I do it all the time. Nuts and nut butters are really important staples for me. They’re such a great way to get in plant protein that’s delicious and satisfying. Almond butter has plenty of antioxidants and calcium, too. It’s funny, I definitely liked peanut butter better for a long time. I feel like almond butter is a bit more of an acquired taste. I grew to love it equally and now find it’s more versatile. It has less of a distinct, strong flavor so you can use it in creative ways, like in place of tahini in a recipe. RELATED: Is Almond Butter Healthier than Peanut Butter? I could eat sweet potatoes at every meal, seriously. They’re a great source of complex carbs, antioxidants, and fiber. I like to make them in big batches for the week. In the morning, I’ll eat half of one with coconut oil, cinnamon, and chopped nuts. At lunch, I’ll slice and throw them on arugula with other leftover veggies, and maybe a little goat cheese. You can make them savory or sweet, and if you slice them and make them into sweet potato fries, kids love them too. Missed my love letter to fried pickles and how I gave them a healthy makeover? Read all about it, here.